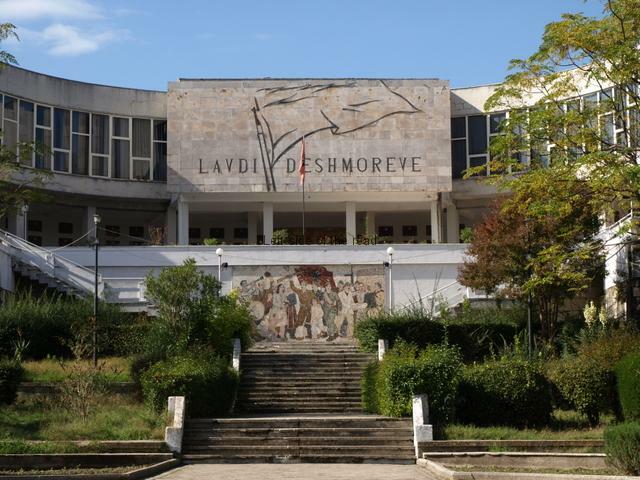 Although there are many monuments and statues that are overtly political, in that they commemorate events or people involved in national liberation struggles (whether that be against the Ottoman Empire or the Italian and German Fascists of World War Two) other aspects of Albanian life are also represented in various locations throughout the country. 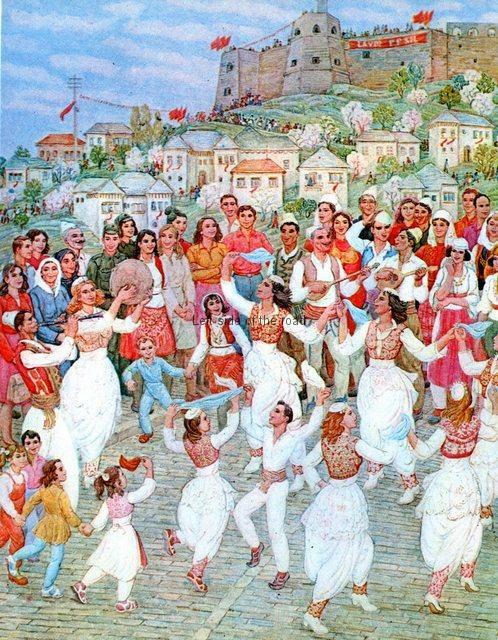 As Gjirokastra, in the Socialist period, had become the centre for periodic folklore festivals it’s not surprising to find a frieze depicting traditional musicians and dancers located there. This is easy to miss. It’s on Rruga Gjin Zenebisi, just a couple of hundred metres further up the hill from the Partisan Memorial, on the left just before the road enters the main square (Sheshi Çerçiz Topulli) of the old town. The artist is Ksenofon Krostaqi, who was also involved in the magnificent obelisk to education which is higher up in the Old Town. 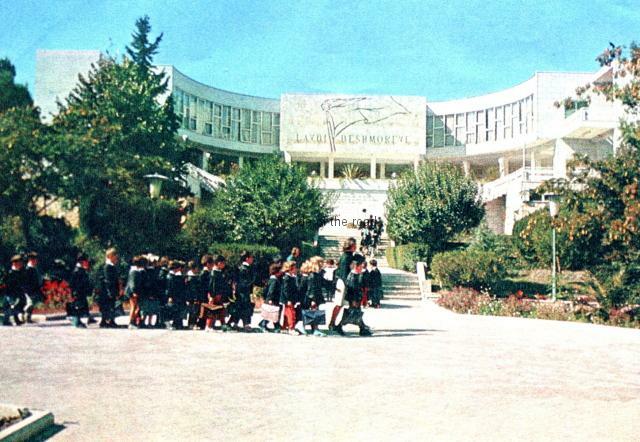 It was completed in 1983, the same year as the Monument to the Partisan. 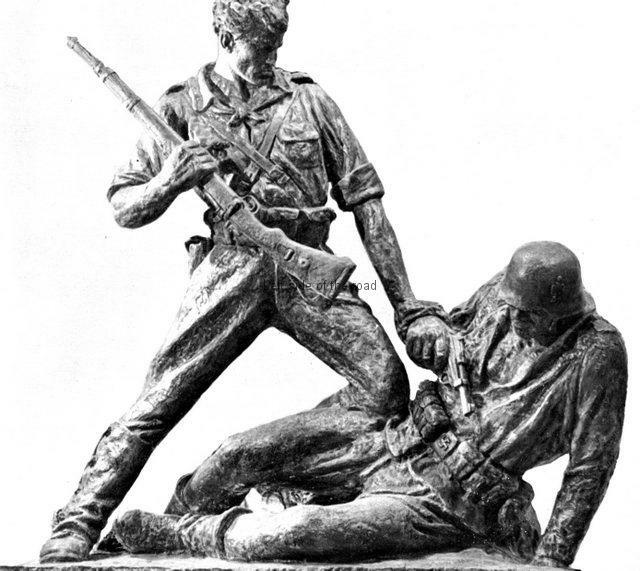 That year was the fortieth anniversary of the liberation of the town from the yoke of fascism and this prompted a certain amount of celebratory sculpture. The frieze is composed of white blocks of lime stone and the carvings of the characters look in good condition. The stone is blackened around the edges (this is north facing and will be cold and damp for much of the year) and apart from a few missing blocks the memorial is intact. It depicts eight different individuals, all in ‘traditional’ dress’. (Here I use the term ‘traditional’ in the sense of the sort of dress that was common before the influence of western fashion took hold in the early years of the 20th century. 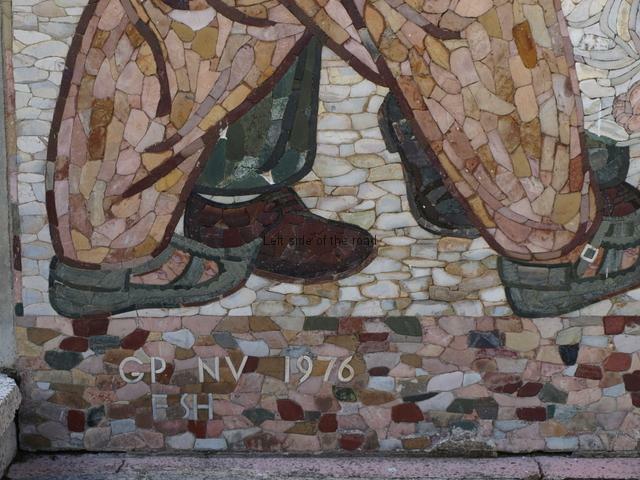 However, even during the National Liberation War against the fascists, from 1939-44, many people in the countryside would have been regularly wearing items of this style as can be seen, for example, on the Peze War Memorial.) 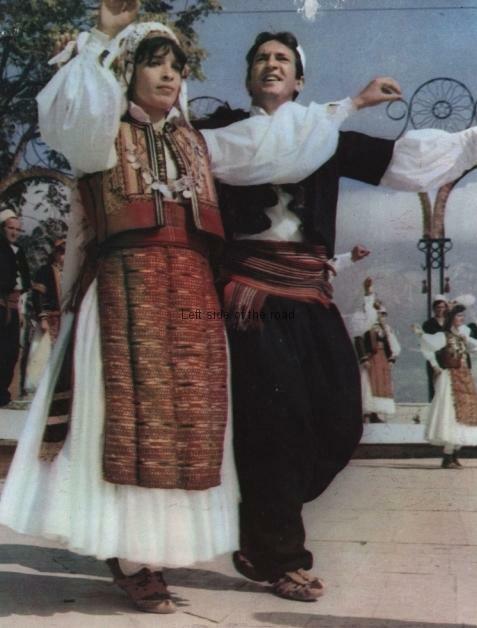 I’m not an expert on Albanian dress, and all areas have their own variations, but I would assume that this is the style of dress typical, at some time in the past, of the Gjirokastra region. In front of him (all the musicians are male) the player holds a defi (a large type of tambourine) high above his head. Next is a young man playing a surlja (an early type of clarinet) with the bell pointed up to the sky. The very end of the instrument is missing, indicating that – for whatever the reason – some of the top stones are missing. The final musician plays a lahuta (which derives its name from the lute), also know as a saze in the south of the country. This is sometimes played with a bow but here he is strumming the strings. 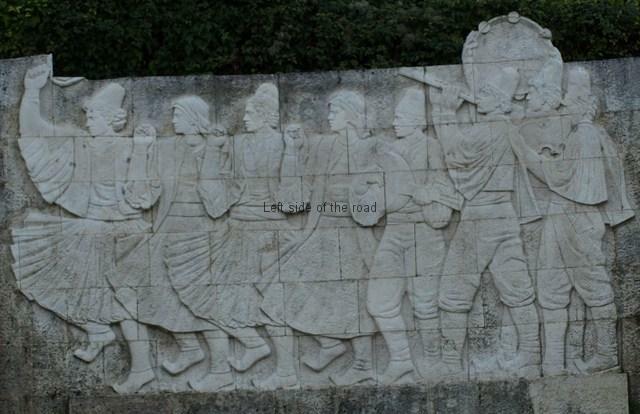 Such a small ensemble of players was quite common in Albania and we can see that being represented (with a slightly different combination of instruments) on the Durres War Memorial. 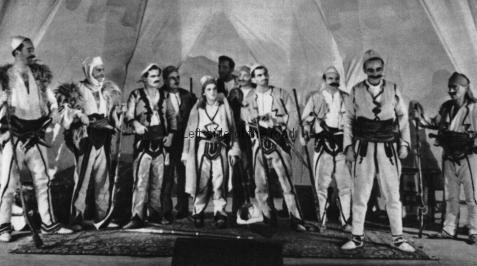 All the men are wearing what looks like the traditional (almost all-Albania wide) xhakete (waistcoat) and tirq (long woollen trousers). On their heads they wear a qylafë, a high woollen hat which is typical of the south of the country. The other four characters depicted are the dancers, two male and two female. 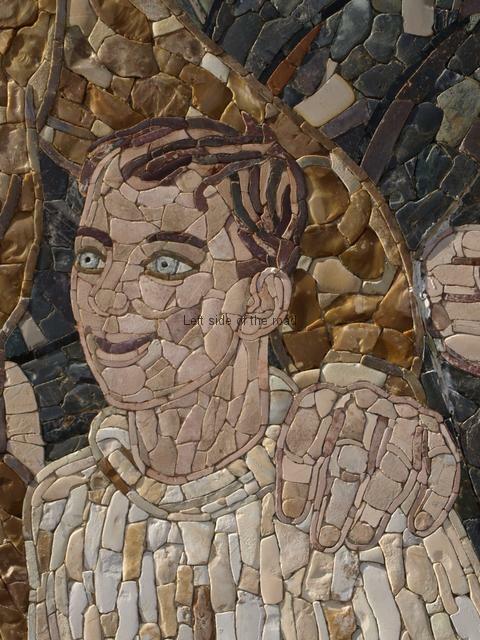 They are in the combination of female, male, female, and finally male and are all facing in the same direction, that is towards the left hand edge of the sculpture. 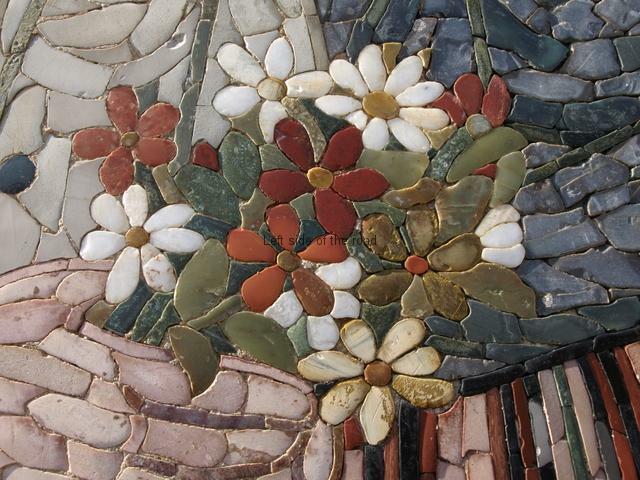 The first three are holding hands which are positioned at shoulder height. The final male is waving a handkerchief above his head in his right hand. There is obviously a missing block of stone here which means we can see the hand holding the handkerchief but not the whole article itself. 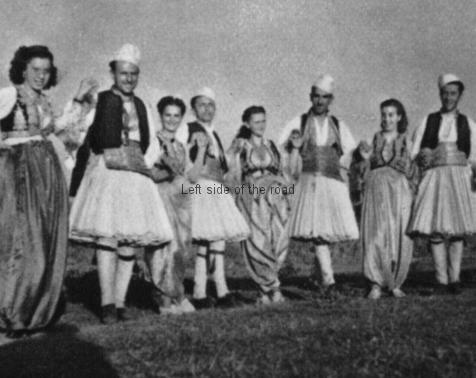 In Albania many of the dances take their name from the region where they originated or are popular but the way these four are dancing is very reminiscent of the Greek Tsamiko (or Zorba’s dance, before he fell over drunk). That would make sense in Gjirokastra as the city is not that far from the border with Greece and influences have passed back and forth over the centuries. From my research both the men are wearing a fustanella (a skirt like garment) over a tirq with an ornate xhakete. The women are wearing what I think is the xhubleta, a long dress together with a long, free-flowing coat. All the dancers and the musicians are wearing opingas, the soft, fabric based shoes with the narrow point at the toe bent up into the air. 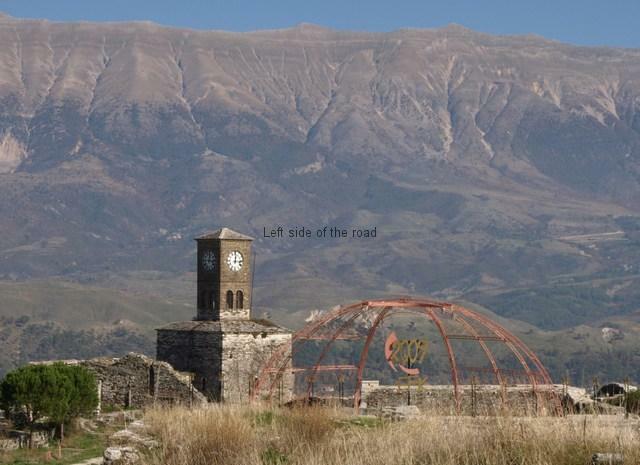 So why this monument here, on the road side in Gjirokastra? After the liberation of the country from the Fascists in 1944 one of the many aims of the new people’s government was to improve the intellectual and cultural life of the population. Illiteracy was almost universal so education was a priority. 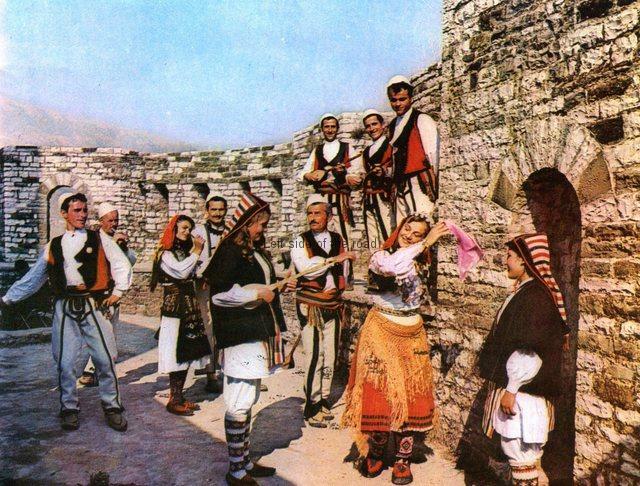 Along with that came a recognition of the preservation and promotion of the Albanian culture through which the people could express their identity. 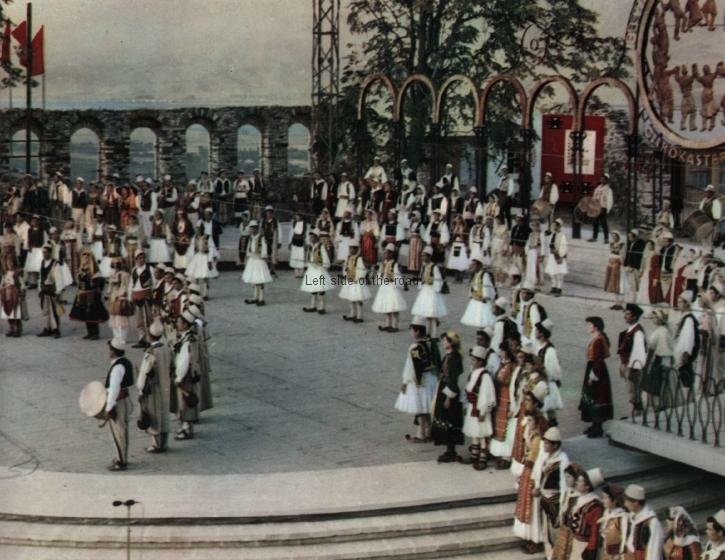 Being a predominantly agricultural society traditional – that is pre-20th century – music, dance and dress were still very much part of people’s lives. However, before 1945 there weren’t any professional theatres whatsoever in the country. 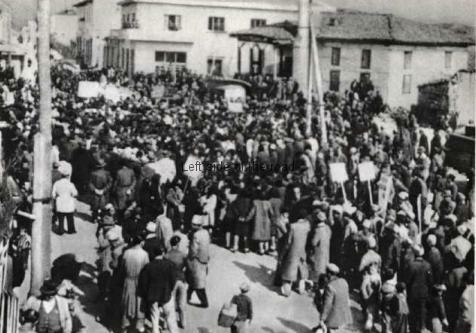 The Party sought to remedy that and by 1951 the number of public performances were four times greater than they had been in 1945. The depopulation of the country in general and some of the smaller villages in particular would also have had an impact on the continuity of the tradition which is vital to maintain a thriving and vibrant culture. It will be interesting to see what happens in three weeks’ time. If you want more information on the up and coming event in May then click here. It’s not ideal as it’s in Albanian but you might be able to squeeze out the information you require.